Ohhhh well now my answer looks completely stupid lolz so I guess I'll just answer it again! yay! Umm probably Breaking Dawn because it has more Emmett moments in it! but All Emmett moments are absolutely EPIC! Hannah: I'm 13 years old so I'm a teen! YAY! For everyone who commented about the laptops: Yah I know its awesome Everyone in 6th grade through senior year get laptops and seeing as i'm going into eighth grade I get one! We got a grant from Apple for brand new Apple Laptops! though I think technology hates me so I don't know if thats a good thing. Shai: *High Fives back* YESSS Teens are AWESOME!!!!!!!!!! If you say you get them in 6th grade why do you get new ones again in 8th grade? Technology hates you? -sqeeks* Technology hates ME!!!! Yeppers, teens are the best. Shai: Im going to be 14 in like a month and a half!!!! and this is the first year we are getting laptops so everyone in every grade gets new ones.!! so YAY! And Believe me Technology and I don't get along at all! I think its trying to kill me lolz. Raven~ Hey, not fair!!!! When is your b-day? but if you are going into the 8th grade? I'm going to be in 9th. But... but if we are in the same age? Where do you live that you actually get free computers? Norway? Shai: Umm I don't usually tell people my birthday because they don't believe me but I was born on September 13 1996. September 13 is Bellas birthday which I hate because people call me a poser and stuff because of. Though I have no idea why people would want to be born on my birthday. Its Friday the 13th. you should see my compy. and they ARE taking over the world! Humans vs. Compies!!!!! I live in Iowa, United States. lolz nothing special about us. and ummm I don't know why were in dif grades. In Iowa you go through two years of Preschool could that be it? Raven~ YOU HAVE THE SAME BIRTHDAY AS MY MOM!!! Hey EDC! I see that there are alot of questions concerning the RULER of DOOOM. So, let me explain. The Ruler comes out, when EDC members don't follow the rules. Usually it's when people don't stay on topic and start posting here in the EDC like we are on FB or Twitter. We in the EDC have tried to keep this thread very topic/opinion friendly and less IM but on occassion it has ventured into the IM or PM field, so the Ruler has been brought out. I can't remember who posted about Derek stealing the Ruler and wacking you with it but that wasn't the official EDC ruler that was used. Just to let you all know, I have control of the Ruler and it's locked up at all times when I don't have it in my possession. So don't believe that you've been hit with it by any one other then me or outside of the EDC, lol! Just to let you know I'm the sole possessor of the Ruler and if you if ask any other "older" member of the EDC, I don't usually use it but it is always around to wack on some fingers for those that constantly break the rules and it never leaves the offices of the EDC, I'm the only one who knows where the Ruler is at, at all times! So on to the questions at hand! What is your favorite Book for Emmettness? Well, I don't have a particular book but whenever Emmett is mentioned or shows up in a book, I love it. I was just really sad that in all the books combined we learned of all of the Cullen's backgrounds except Emmett's and that we had to go to SM's site to find out about him. If Emmett were to be a shapeshifter what animal would he shape shift into other then a Bear? In my mind, I could see him as being a lion or a tiger or some other dominate animal figure. I could also see him being a wolf. With his ultimate strength and fighting skill, I could really imagine him being a leader of a wolf pack. So now I have a question for you all. Okay, I'm out, just remember the rules and you won't have to suffer the wrath of the Ruler and have fun! Toodles and Sending Much Love! Hi everyone!! Now to answer some questions. What is your favorite Book for Emmettness? Just for Emmettness is definitely BD. We see him a lot more in this one & he has some classic moments & lines. If Emmett were to be a shapeshifter what animal would he shape shift into other then a Bear? I see him being like tiger. They are very dominate animal & plus I love tigers. My favorite animal is a white tiger. 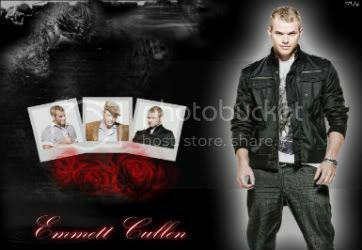 If Emmett wasn't with Rose, who do you see he could be with in the Twilight world? Wow. Okay this is hard. In the Twilight world.............I guess maybe Jessica. But jus because Rose & Jessica are a lot alike. I can't see him being w/anyone besides Rosalie. Liz: I think your right, I think the brother was Derek. Where is Derek? has anyone seen him for a while? Hannah: Awesome! She was born on September 13th too? Yay im not the only one! Okay I agree with the whole Emmett would be dead cause Rose wouldn't of been able to save him. But If I HAVE to choose I would say okay this is going to sound really weird but maybe Leah. Because they are both sarcastic and stuff.